Its difficult to go anywhere in the southern Appalachians and not encounter some species of rhododendrons. Rhododendrons are evergreen members of the azalea family and they are very abundant. Depending on the species and the elevation, they generally bloom from May into July. More info than I could possibly give you is available from the Rhododendron Page at Tyler Arboretum in Media, Pa.. The two most abundant species are the Purple Laurel or Catawba Rhododendron, Rhododendron catawbiense and the Great Laurel or Rosebay, Rhododendron maximum . The Catawba Rhododendron grow mostly on bald mountain tops at higher elevations (above 5000') and spectacular displays can be viewed in late May to late June at Roan Mountain, 13 miles north of Bakersville, NC or at Craggy Gardens along the Blue Ridge Parkway north of Asheville. The Rosebay are very abundant plants of the forest understory and in the winter, their greenery is a very welcome sight. They have an interesting habit that a branch will alternate a year of bloom with a year of growth. 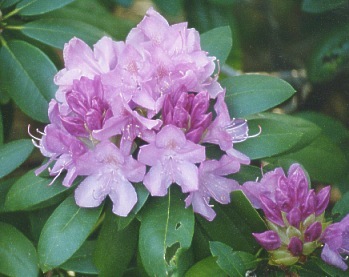 Principally, rhododendrons are used as landscaping plants and many hybrid varieties are available. Artists and craftspeople also use the hard, twisted wood in making walking sticks and freeform furniture. 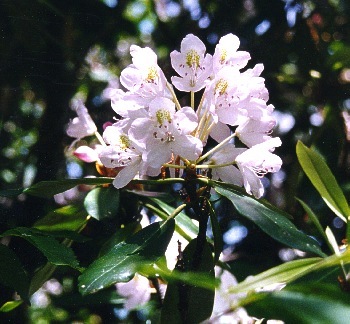 Along with the rhododendrons, other members of the Ericacea family represented in the area include native azaleas--Flame Azalea, Pinkshell Azalea, Pinxter Flower and the closely related Mountain Laurel, Kalmia latifolia.